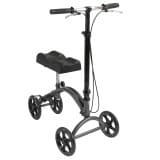 Knee Scooters are a much better option than Crutches for most People and are for use for those with lower leg injuries or after surgery, and are Available to Rent or to Buy! Now Available in Calgary and Victoria! Calgary: Call 855-636-5705 to RESERVE or to MAKE INQUIRIES.